Get expert advice on medical negligence claim with a free, no obligation consultation. Medical professionals have a duty of care towards their patients. They are legally and ethically required to exercise utmost care when treating patients. Thankfully, in most cases they do. Sometimes, however, things go wrong. A mistake or negligence on the part of a medical professional can make an existing condition worse or it can result in new injuries or illnesses. If you have suffered because of clinical or medical negligence, you may be eligible to claim compensation for your injuries. What Claims Are Covered Under Clinical And Medical Negligence? Incorrect diagnosis leading to wrongful treatment. Delayed diagnosis resulting in the treatment getting delayed. A mistake during a invasive surgical, dental or optical procedure. Failure to inform you about the risks involved. Infection contracted as a hospital in-patient. Mishandling during labour or delivery resulting in an injury to the mum or the newborn. Faulty, unsterile or badly maintained medical, dental or optical equipment. Cosmetic procedure that did not result in the promised transformation. Improper or inadequate mental health treatment. An injury resulting from clinical or medical negligence can have a devastating effect on your life. Medical negligence leaves you sicker or more injured than you were before you sought medical advice or treatment. This could manifest itself in several different ways, from being in debilitating pain to experiencing temporary or even permanent mobility or sight restrictions. Not only will your quality of life suffer but there could also be tremendous financial ramifications. There will be additional medical bills, which could be ongoing for an extended period of time. If you have to take time off from work, you would also have to deal with loss of income as well as loss of opportunities in terms of promotions and other bonuses. If your injuries have been as a result of medical negligence, you are entitled to be compensated for your pain and suffering as well as your financial losses. What Can You Claim For In Clinical/ Medical Negligence Cases? Out of pocket expenses – This includes all expenses that you’ve already paid towards medical treatment, doctors’ consultation fees, hospital stays, prescription medication and all diagnostic and surgical procedures. You can also claim for travel expenses to medical appointments and back as well as additional costs to help with daily living. Loss of income – This includes all earnings lost due to time you’ve already had to take off work due to medical negligence as well as time off you may need in the future. This may also cover scenarios such as not being able to return to the same position, loss of promotion or not being able to return to work. Further/ongoing treatments – You are also entitled to be compensated for any further medical treatment or procedures that may be necessary to counter the effects of the negligent treatment. Adaptations – If the treatment leaves you unable to function independently, you may need to make structural changes or add certain devices to your home or vehicle in order to help you function more independently. You are entitled to be compensated for these additional expenses. Cost of care – This covers all additional costs necessary for past, ongoing and future rehabilitative treatments as well as home care visits and counselling. 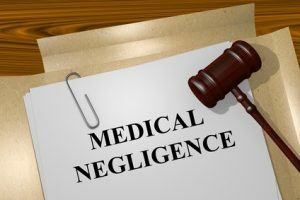 For your medical negligence claim to be successful, in addition to proving that the healthcare professional failed to carry out their duties responsibly, you also need to prove that it was this negligence that resulted in your present injuries. This can be exceedingly difficult to do. You have to first pay an independent medical expert to look into what happened and what went wrong. You then have to put together all of the facts and other details and build a strong case in your favour and file it before the 3 year time limit. Even if you do manage to do all of this, it can cause you a whole lot of unnecessary stress that can hamper your recovery. When you contact our experienced medical negligence solicitor, you can leave it all in their experienced hands without having to pay any legal fees upfront. You will always get a free first consultation during which time the solicitor will evaluate the facts and let you know whether or not you have a strong case, in their professional opinion. If you do, they will agree to represent you on a Conditional Fee basis, better known as No Win No Fee (more on that here). This states that you will only have to pay a fee on condition that your medical negligence claim is successful and you receive the compensation awarded. This takes the stress off you right at the start as you do not need to worry about where to get the money to get proper legal representation. Moreover, with a medical negligence solicitor representing you, you do not have to deal with any of the stress associated with building and filing a compensation claim. Medical negligence solicitors are highly knowledgeable about this area of the law, as you should expect them to be. Ours know what to look for and how to build a solid case to increase your chances of filing a successful case. They also have access to medical experts who they can approach so that saves you the trouble of looking for one yourself. To speak with a medical negligence solicitor today just give us a call. Alternatively fill out the form below page and we can give you a call back, and get your medical negligence claim started right away.